First Line: In the old brownstone house which was the dwelling, and also contained the office of Nero Wolfe on West 35th Street near the Hudson River in New York, heavy gloom had penetrated into every corner of every room, so that there was no escaping from it. In my never-ending quest to further my knowledge of Golden Age mystery writers, I downloaded Rex Stout's first Nero Wolfe novella as well as one of his short stories to my Kindle. Bitter End concerns the family business and personal relationships of a specialty food manufacturer. Nero Wolfe's chef is ill and unable to cook, which-- being new to this series-- I gather is quite the catastrophe. When someone comes to ask Wolfe to investigate food tampering in a family owned and operated factory, the only reason why Wolfe accepts the case is because he's just tasted the paté in one of the sabotaged cans. Of course, Archie Goodwin is the one who does all the real investigating, and as I read I found that I really enjoyed Archie's voice. Bitter End is a fast-paced and rather easy-to-solve mystery. The short story "Out of the Line" paints an atmospheric portrait of New York City that I found rather poetic. In it, a spoiled rich woman decides to make someone else happy on her birthday, and Stout has a nice little ironic twist at the end. 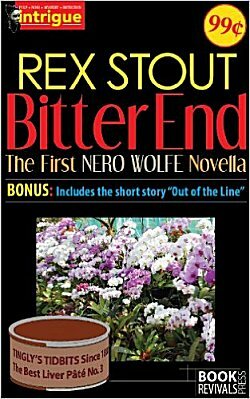 All in all, Bitter End and "Out of the Line" are exactly what I was looking for: a good, solid introduction to Rex Stout, Nero Wolfe, and Archie Goodwin. I wouldn't be surprised if I read more in the future. Oh, I didn't know about this Nero Wolfe book. I have read "Fer-de-Lance," the first novel. I enjoy this series whenever I need light, humorous reading. And I often laugh out loud while I'm reading the Wolfe/Goodwin dialogues. It is like taking a mini-vacation to read one of these books, distracting, entertaining, witty. I read some of the books while a teenager, as my father read them, but came back to them after reading Yvette Banak's blog, as she is an ardent fan of the books. Now I can see why, too. I love Yvette's blog. Yes, I just keep finding all these gems to add to my list! As far as I know, I have not read that story. Archie is a wonderful narrator. I don't think the Nero Wolfe books would be half as interesting without him. They are well worth reading. And if you can get the two seasons of the most recent Nero Wolfe series, they did an excellent job with Archie and Wolfe. Yup, that's the one. Whenever I read the Nero Wolfe books, he's the one I picture as Archie. And the actor who played Wolfe as Wolfe, and the actor who played Fritz as Fritz, etc. It was really a shame they cancelled that series. Timothy Hutton as Archie, Maury Chaykin as Wolfe. Loved that TV series. Maybe I should buy it so I can always watch it. I wonder if they have it on Netflix? I'll have to take a look. Well...make a note. I won't be having anything to do with a television for several more hours!